Providing you the best range of autofy bike riding gear jackets, autofy bike riding gear accessories (chest armor protector), autofy car wireless bluetooth reciever and autofy bike 2 speaker radio with effective & timely delivery. 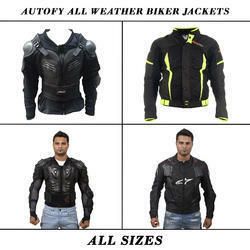 The Autofy Rider jackets are the best riding gear / accessory you can have at a very reasonable and low price. These jackets are your best mates when you plan any bike drive to Highways, Mountains, City Long rides etc. These best in class jackets are for both Men, Women, Boys and Girls. Autofy Jackets serves all your riding needs. The jackets have removable paddings fitted inside so as to make it a multi-purpose wearable accessory. The 5 removable paddings are present on Shoulders, Elbow and Back. Removable Motion Flex Armour at Elbow and Shoulders and Removable Motion Flex Articulated Back Protector makes your riding safe and prevents direct impact. The outer shell is made of ballistic meshed design allowing air to flow in and avoid excessive sweating by maintaining fresh air flow inside to enhance your riding experience. The jacket has multiple adjustable points like on the waist and arms to make it fit perfectly to your body. The Jacket has a 2 layer clothing where outer shell is made of meshed ballistic fabric and inner is lined with soft, stretchable, sweat absorbing material to give maximum wearing comfort. A small inner pocket is also given to keep essentials like Wallet or Mobile Phones, Cash Etc. The soft Neoprene Chinese collar prevents irritation and gives a soft touch to the neck, the collar is also fitted with a hanging cloth hook to hang the jackets to stands etc. This is a highly used product by bike enthusiasts, biker lovers and biker boys who love their bikes Royal Enfield Bullet Standard 350, Royal Enfield Bullet Standard 500, Royal Enfield Bullet Classic 350, Royal Enfield Bullet Classic 500, Royal Enfield Bullet Classic Desert Storm, Royal Enfield Bullet Electra, Royal Enfield Bullet Thunderbird 350, Royal Enfield Bullet Thunderbird 500, Avenger, Pulsar, Duke KTM, Harley Davidson, Yamaha FZ, R15, CBR, Ninja, Apache, Hayabusa and other bikes. Autofy red dragon chest armour vest is the best protective accessory available at a very low and reasonable price. This red chest vest or armour is made from premium quality and high density PP shell which can stand very heavy impact. The nylon is wear and tear resistant and has a very long life. The inner bio foam comes with ventilation which maintains a very proper air flow and keeps the body fresh with clean air and no sweat. The inner foam padding is very skin-friendly, it also absorbs the outside shocks. The carefully engineered design makes it a low thickness hard shell thereby which can be worn inside T-shirts, shirts, formal dresses, casual dresses, jerseys, riding jackets, jackets etc. The shoulder has adjustable straps which can be adjusted according to your body build and shoulder width and size. The waist has plastic clip mechanism for better fitting and long life. This makes the armour to fit very tightly to your body and protect you. The back vest can be removed to make it a chest only armour. Multipurpose vest for any activity like bike driving, mountain driving, highway driving, trekking, skating, cycling, boxing etc. This is a highly used product by bike enthusiasts, biker lovers and biker boys who go love their bikes Royal Enfield Bullet Standard 350, Royal Enfield Bullet Standard 500, Royal Enfield Bullet Classic 350, Royal Enfield Bullet Classic 500, Royal Enfield Bullet Classic Desert Storm, Royal Enfield Bullet Electra, Royal Enfield Bullet Thunderbird 350, Royal Enfield Bullet Thunderbird 500, Avenger, Pulsar, Duke KTM, Harley Davidson, Yamaha FZ, R15, CBR, Ninja, Apache, Hayabusa and other bikes. 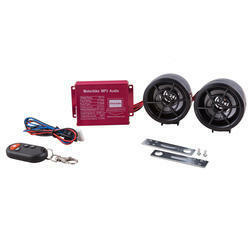 Car audio systems are on the course of evolution. Though evolution does not have to mean it has to come at a high price. This statement has been proven to be true by Autofy Car Bluetooth Audio Receiver as it comes with top notch technology to bring you the ease of wireless technology without any compromises in the audio quality no matter how loud you play your music. This has been made possible through Bluetooth 2.0 +EDR with A2Dp profile support which is responsible for the eminence this device has to offer in terms of speedy data transfer. Thus there is no lag in streaming your music from your phone to your car audio. Neither is there any restrains on paired device’s movement while connected to the Bluetooth receiver device as Autofy Car Bluetooth Audio Receiver offer connectivity within 10 meters radius. The 3.5 mm headphone jack supports connectivity with both headphones as well as AUX port of all audio devices through male-to-male connectivity jack provided in the package. Offers a long battery life that lets you stream your favourite music for up to 8 hours. In case you still run out of battery, you can easily charge the receiver from a USB port using the USB Cable provided along. You can easily pair Autofy Car Bluetooth Audio Receiver with your playback device through following procedure: (1) Ensure the speakerphone is under OFF mode. (2) Pairing: Press and hold the ON/OFF button for 7 seconds until you hear the "Ready for connecting or a sound" (when you holding the button until you hear the voice report "Ready for connecting"). The LED indicator will flash between red and blue alternately. It is now ready for pairing. (3) Activate your mobile phone's Bluetooth function and search for available Bluetooth devices by referring to your mobile phone user manual for details. (4) Select "BT Receiver" from the list. (5) When paring is completed, the voice reports "connected or short "beep beep" The LED indicator will flash Blue alternately. Autofy 2 Speaker Radio and MP3 Player with Bike Locator and remote are the best driving accessory available to you at a very and reasonable price. This is a universal product and can be fitted into all the bikes and scooters (geared/non-geared). Smart Bike protector feature - press the Lock Button on the remote. The speakers shout ALERT ON. Whenever someone touches your bike, DO NOT TOUCH alarm starts. The console has Radio receiver, Memory Card and USB if you want to listen your custom playlist. The two speakers have a very loud sound which is easily audible even if you are driving. This is the best product for any rider going for highway rides, mountain rides, leading a bike gang etc. Professional installation is advised. The speakers are connected to the metal clamp and fixed on the handle bar or leg guard. The remote provided with the player helps you to control the console without hassle - The remote has Vol +/- buttons, Mode changer and Bike Locator. This is one preferred product of the biker boys and many bike riders having Royal Enfield Bullet Standard 350, Royal Enfield Bullet Standard 500, Royal Enfield Bullet Classic 350, Royal Enfield Bullet Classic 500, Royal Enfield Bullet Classic Desert Storm, Royal Enfield Bullet Electra, Royal Enfield Bullet Thunderbird 350, Royal Enfield Bullet Thunderbird 500, Avenger, Pulsar, Duke KTM, Harley Davidson, Yamaha FZ, R15, CBR, Ninja, Apache, Hayabusa and other bikes. The lights have machine gun design and are very strong to withstand extreme weather conditions and shocks. The carefully engineered design consumes very less power ensuring no battery drainage.